New NWMPHN Board directors Damian Ferrie, Genevieve Overell and Dr Kathy Alexander. 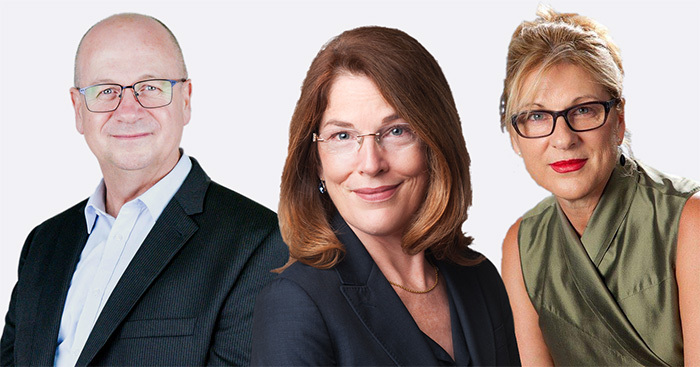 Three new directors have joined the North Western Melbourne Primary Health Network Board of Directors, bringing with them a wealth of experience in government, community services and health management. Dr Kathy Alexander is an experienced board member and chair in public, private and not for profit organisations with an international reputation for stakeholder management, community engagement and effective public relations in complex and politically sensitive environments. Dr Alexander has held a range of board and executive roles, including as the CEO of the Royal Children’s and Royal Women’s hospitals in Victoria, the CEO of the City of Melbourne, Chair of Administrators of the City of Greater Geelong, and Chair of Eastern Melbourne Primary Health Network. Damian Ferrie is currently the CEO of the Star Health Group Ltd, a community health provider in the Bayside suburbs of Melbourne, and has a wealth of experience in the not for profit sector including the acute hospital sector. Mr Ferrie is Chair of Mental Health Victoria and a Director of the Inner South East Metropolitan Partnership. Recently he has held positions on the Boards of the Victorian Healthcare Association and Port Philip Housing Association (now Housing First). A lawyer by background, Genevieve Overell has extensive experience on boards across the public sector, charities, international trade and investment, health sector, industry peak bodies, professional membership organisations, consultative committees and the arts. Ms Overell has held a range of senior government roles including as a Deputy Secretary in the Victorian Government responsible for land-use, planning and building, was a partner at KPMG specialising in major public infrastructure projects and is a Past President of the Victorian Branch of the Australian College of Health Services Management. NWMPHN Chair Dr Ines Rio welcomed the new directors to the Board, saying the diversity and breadth of their experience would strengthen the Board’s ability to provide oversight and guide the future direction of the organisation. “An experienced, diverse and engaged Board of Directors is crucial to the success of NWMPHN, and I am confident our new directors will make our already highly effective Board even stronger,” Dr Rio said.